Franz Ittenbach (German, 1813–1879), Mother of the World, 1872. Oil on panel. Milwaukee Art Museum, Purchase, René von Schleinitz Memorial Fund and with funds in memory of Betty Croasdaile and John E. Julien. From the glittery gold background to the touching depiction of the Madonna and child, the Milwaukee Art Museum’s new acquisition Mother of the World by Franz Ittenbach (German, 1813–1879) is a perfect subject for our blog post during the weeks leading up to Christmas. At first glance, Mother of the World probably reminds you of the painting that I highlighted two years ago during the holidays: Nardo di Cione’s Madonna and Child. But Ittenbach is a German artist of the 19th century, not an Italian artist of the 14th century! Clearly, Ittenbach is looking back at paintings like the Nardo. This is because he is part of a German art group called the Nazarenes. The Nazarenes were widely admired in early nineteenth-century Germany, but today most people have never heard of them–even those who have studied art history. The movement started around 1818 when a few young German artists, including Friedrich Overbeck (German, 1789–1869) and Friedrich Wilhelm von Schadow (German, 1788–1862), reacted against the styles of more recent history. They wanted something different from the extravagant and overblown Baroque and stilted and erudite Neoclassical. So, for inspiration these artists turned to art of the late Medieval and early Renaissance. Also, believing that art should serve a moral purpose, the Nazarenes created artwork that was usually Christian in subject matter. The paintings that resulted have a naturalistic yet linear style, a high attention to detail, and a quiet faith. You might be asking: where did the name “Nazarene” come from? Because the artists followed a Christian lifestyle and wore Biblically-inspired hair and dress, they became known as Nazarenes, which is a person from Jesus’s boyhood home of Nazareth. Nazarene artists had great influence in the early nineteenth century. Not only were they commissioned by churches to do paintings—both free-standing panels and wall frescoes—but they also taught many artists. One of these second-generation artists was Franz Ittenbach. Ittenbach studied at the Dusseldorf Academy under Wilhelm Schadow, even traveling to Rome with his mentor to absorb the visual inspiration of Italy. A devout Catholic, and it was rumored that Ittenbach took both confession and communion before executing some of his greatest commissions. Mother of the World is an ideal example of Ittenbach’s painting style. The Virgin and Child are seated upon a gold and jewel‑encrusted throne surrounded by a shimmering heavenly realm. Mary is dressed in traditional blue robes, edged with jewels, and she wears a crown as the Queen of Heaven. Meanwhile, Christ demonstrates his dominion over the world by holding a globe and cross in one hand and blessing the viewer with his other hand. tui, nobis post hoc exsilium ostende. 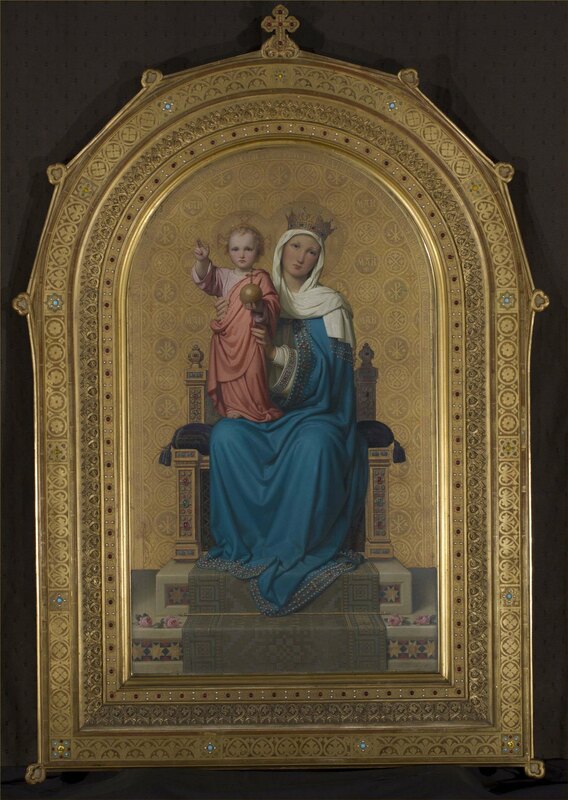 Mother of the World is the first example of the Nazarene school to enter the Milwaukee Art Museum’s collection. We are pleased that it is on view just in time for Christmas, so our visitors can enjoy its beauty and power in person for the holiday season! This entry was posted in Art, Curatorial and tagged 19th Century Art, European art, From the Collection, Holidays. Bookmark the permalink.